Bubsy: The Woolies Strike Back Review - Pawsitively Middle Of The Road — GamingWithSwag.com - Dads By Day, Gamers By Night. Graphics/Style: 90s 2-D platformer with a wise-cracking bobcat. Music/Soundtrack: Songs aren't bad, there are just two that are recycled frequently. Could use some more tracks. 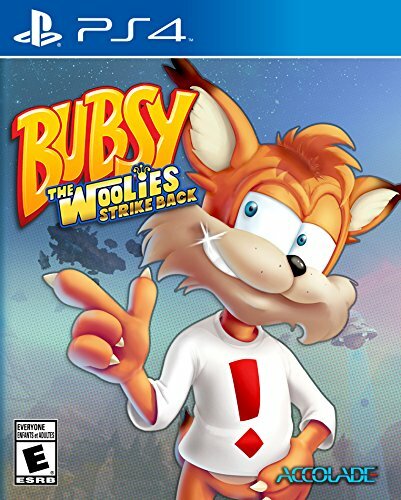 Story: Bubsy lost something, defeat the Woolies to get it back. Replay-ability: Moderate, there is plenty of Yarn, shirts, and keys to collect in each level. Time Commitment: Each level takes less than 15 minutes to complete, unless you are trying to collect everything in the levels. Value: $29.99 is pretty steep considering there are only 9 main levels to complete. Favorite Element: Over 100 one-liners that make Bubsy, well Bubsy. The levels are pretty basic, and predictible. I don't know what to say. 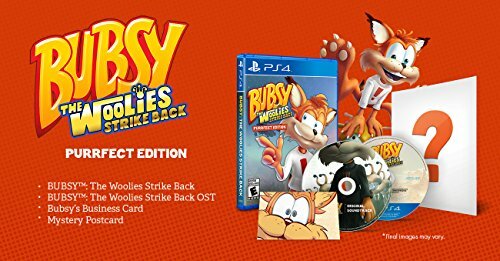 I wanted Bubsy: The Woolies Strike Back to blow me away. I remember fondly how I kept renting the original Bubsy game from my local Movie King down the street. The game was tough as it included floaty controls and fall damage, but still had some charm despite them. I am happy to report that those two issues have been removed from this sequel, but somehow the developers forgot what makes a Bubsy game so unique. Ridiculously fast water slides, doors that could take you instantly in other places in the vast level, and even trampolines that launched the furry mascot way into the air were all present in that little cartridge from 1993. However, most of this is completely missing in Bubsy: The Woolies Strike Back. Instead we are only seeing elements that kind of resemble Bubsy who is a shadow of his former self. The gameplay feels and looks like a generic platformer, however as a Bubsy game there is an amazing amount of one-liners getting tossed around, especially when you turn the dialogue all the way up to the "Bubsy" setting. Although the game seems uninspiring, the controls are decent. Added to the typical run and jump on enemies archetype, Bubsy now is able to do a pounce attack which comes in handy when flying at high speeds through levels. He also can chain moves together, creating combo maneuvers. There is plenty of yarn to collect, and there are series of Bubsy shirts and keys that can be collected for those wanting some replay out of the game. There is plenty of yarn to collect and plenty of traps to avoid. Although the levels are somewhat larger than your standard platformer, Bubsy: The Woolies Strike Back features only 9 regular platforming levels, 3 boss battles, and an initial tutorial level so the game is really short and can be completed within a couple of hours. 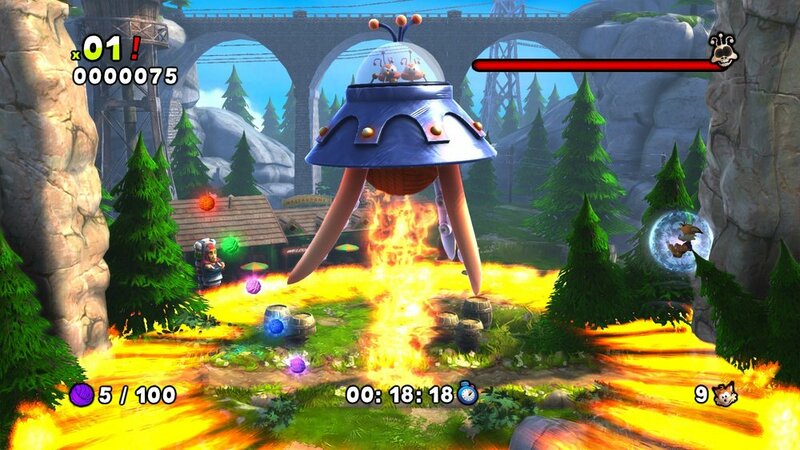 I wasn't too impressed with the boss battles either, each is a UFO variant that just requires some dodging and patience to be able to hit the boss a few times. Boss battles are more tedious than challenging. I feel like after the last Bubsy game, Bubsy 3-D for PlayStation, this was Accolade's chance to get platforming fans back on board with Bubsy, but instead we get something that really could use more content and more polish. The announcement of this new sequel came out of nowhere, and the physical as well as a limited "Purrfect" edition releases were shown which made it seem like they were giving the game its due however I didn't find one single water slide, door, or even one secret room. Platforming games as a genre have to hold up to repetition so people want to challenge themselves with speed runs and to find all the secrets and they didn't develop a game that can hold up to extended exposure. I am a little disappointed. It might be nostalgia, but the things I actually liked about Bubsy didn't make it into Bubsy: The Woolies Strike Back. If you remotely like Bubsy and his one-liners you should check this out on a deep discount, otherwise there are better platformers out there for your buck including the original game.